The freewheeling way to explore the U.S.A.
Our friendly, expert authors get you ready to roll with practical advice, whether you're a novice or experienced RVer. From buying or renting your rig to how to outfit it, you'll get essential info. When you're on the road, there are 14 trips that cover the country from coast to coast, whether you want to enjoy lobster in Maine or get your kicks on Route 66. Regional itineraries for every part of the U.S.
Shirley Slater and Harry Basch are a husband-and-wife travelwriting team whose books, articles, and photographs have been published internationally over the past 25 years. Former stage, film, and television actors, they have written their syndicated column Cruise Views for the Los Angeles Times and other major newspapers for more than 20 years, produced six annual editions of the North American Ski Guide for Prodigy Computer Services, and written Shirley and Harry’s RV Adventures (a monthly newsletter) plus four books on worldwide cruising. 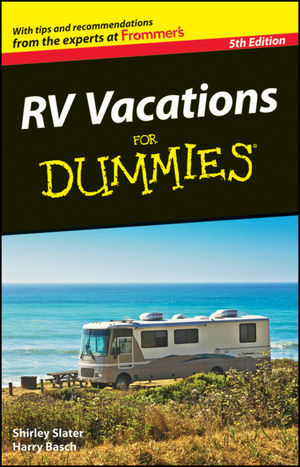 Chapter 1: Top Reasons to Take an RV Vacation. Chapter 2: Digging Deeper into RVing. Chapter 3: Deciding Where and When to Go. Chapter 4: Packing It In. Part II: Ironing Out the Details. Chapter 5: Managing Your Money. Chapter 6: Selecting Your RV. Chapter 7: Dealing with Your RV. Chapter 8: Eating on the Road. Chapter 9: Sleeping on the Road. Chapter 10: Catering to Special Travel Needs or Interests. Chapter 11: Tying Up Loose Ends. Part III: Exploring the East. Chapter 12: The Coast of Maine: Lobster Land. Chapter 13: Western New York: Cooperstown to Niagara Falls. Chapter 14: The Blue Ridge Mountains: Skyline Drive and Blue Ridge Parkway. Chapter 15: The Gulf Coast: Tallahassee to New Orleans. Chapter 16: The Natchez Trace: Natchez to Nashville. Chapter 17: Texas Hill Country: Bluebonnets and Barbecue. Chapter 18: The Heart of Ohio: A Circle around Circleville. Chapter 19: Northern Minnesota: Paul Bunyan Country. Chapter 20: The Ozarks and Branson: Hot Springs to Springfield. Part V: Seeing the West. Chapter 21: Montana and Wyoming: Tracking Buffalo Bill. Chapter 22: New Mexico: Billy the Kid Meets E.T. Chapter 23: The Oregon Coast: California to Washington . Chapter 24: California’s Central Coast: Malibu to Monterey. Chapter 25: Route 66: OK to L.A.
Chapter 26: Ten Great Snowbird Getaways. Chapter 27: Ten Cool Factory Tours. Chapter 28: Ten Zany Museums.